It was a lucky seven for the Rangers who played 7-Up in a wild and crazy 7-4 home win over the Sharks at The Garden. They continue to look dangerous offensively. That offense was good enough to hold off a furious San Jose rally which cut a 5-2 lead to 5-4 with still 4:29 left in the game. Two empty netters from Mats Zuccarello and Michael Grabner sealed the team’s second win in three games. Antti Raanta made a big save denying Patrick Marleau’s bid to tie it prior to San Jose coach Pete DeBoer mistakenly pulling starter Martin Jones early when his team didn’t have clear puck possession. A turnover at center ice allowed Zuccarello to shoot into an open net with 1:36 left. MSG breathed easier with the speedy Grabner scoring unassisted at 19:53. This was a game they would’ve lost if it were last season. Ditto for their Opening Night win over the Islanders after they blew a 2-0 lead before Chris Kreider scored in what amounted to a 5-3 win. They were also plenty good enough in a tough 3-2 loss at St. Louis. Here’s the early takeaway on the 2016-17 New York Rangers. They are fully capable of scoring enough goals to win track meets like the one they won tonight against arguably the West’s best. Whether it’s sustainable is a big question mark. At times, the defense has looked okay. In other instances where they’ve been on their heels and given up quick goals in the third period, you wonder sometimes. Three games and they have allowed 10 goals. Each starter giving up at least three. The biggest positive remains the dominant play of Kreider, who recorded his third two-point game of the season. Already with three goals and three assists, the 25-year old power forward looks bigger, stronger and faster. He isn’t just more noticeable on offense where he’s thinking shot more like the high snapshot he surprised Jones on short side. But Kreider is playing both ways hustling back defensively by using his speed to break up plays. At the moment, the ’16-17 version of Chris Kreider looks possessed. It was a great fore-check by Kreider and pass for an open Ryan McDonagh shot that led to a favorable carom for Rick Nash’s first goal giving the Rangers a 2-1 lead at 4:15 of the second. 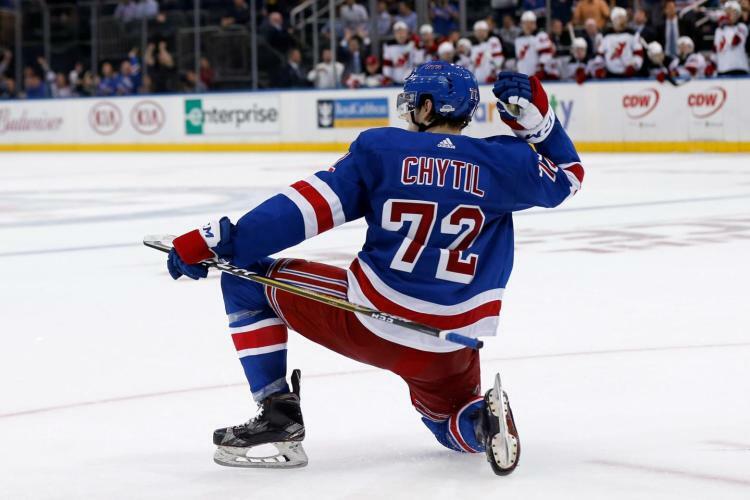 Up to that point, they played a near flawless first with a terrific shift from Zuccarello and Derek Stepan leading to a good one-time blast from Marc Staal past Jones for the game’s opening goal. San Jose drew even thanks to a missed call on Brent Burns which led to a four-on-two rush with Joe Thornton and Joe Pavelski combining to set up Logan Couture for a power play goal at 19:02 of the first. Honestly, that Burns wasn’t penalized for cross checking Nash and falling on top of him behind the San Jose net was truly awful. The Sharks were on a two-man advantage thanks to a Jesper Fast hook. Couture’s goal never should’ve happened. Brutal officiating. When asked about it by MSG’s John Giannone during intermission, Nash was diplomatic. He acknowledged the refs missed it but that part can’t be controlled. The bottom line is he moved on and scored from McDonagh and Kreider. The best revenge he can get. He looked fantastic on the first line with Mika Zibanejad and Kreider with Pavel Buchnevich (back spasms) out. It was Kreider who made it 3-1 when he took a McDonagh feed in the neutral zone and flew into the San Jose zone and wired one top shelf- catching Jones leaning. A wicked shot and quick release by a player who looks more determined. Raanta actually drew a assist starting the play. They led by that margin after two. The third was unpredictable. The teams combined for seven goals playing the third period version of 7-Up. First, Burns absolutely got all of a wrist shot on a neat pass from Pavelski, who had four points in defeat. With the game still 3-2, Fast atoned for his minor penalty by skating around Paul Martin and finding a cutting Kevin Hayes, who badly beat Burns for his first of the season at 12:16. J.T. Miller started it for his first assist. On the next shift, it took them only 21 seconds to increase the lead to 5-2. Both Jimmy Vesey and Zuccarello made strong defensive plays to keep a play alive. The end result was Zuccarello cycling and finding Stepan, who threaded the needle for a wide open Vesey, who made no mistake blasting his first career NHL goal by Jones at 12:37. Well deserved for the 23-year old rookie who was overdue. He had a whale of a game. But before they could settle in, the Sharks took advantage of an icing. Pavelski won a draw and set up Burns for another huge blast with the big caveman using McDonagh as a screen to beat Raanta to cut it to 5-3 at 13:57. It got dicey when Pavelski tipped in a Burns point shot less than two minutes later with Tomas Hertl also assisting. They nearly came all the way back but Raanta made the save of the game kicking out a tough Marleau shot. Zuccarello and Grabner finished it off. This entry was posted in NYRangers and tagged Antti Raanta, Brent Burns, Chris Kreider, Derek Stepan, Jimmy Vesey, Joe Pavelski, Kevin Hayes, Logan, Marc Staal, Mats Zuccarello, Rangers, Rick Nash, Sharks. Bookmark the permalink.